Let’s take a closer look at these three victories. Using virtual machines running the latest Microsoft Windows Server 2008 R2 SP1 and SQL Server 2008 R2, VMware ESXi 5 churned out 18.9% more orders per minute with the DVD Store 2 benchmark, proving once again that superior vSphere technology enables more work to be done on less physical equipment. Higher density virtualization translates into fewer servers, network ports, power, space, cooling, and software licenses — reducing costs for your cloud infrastructure. With the shift to cloud-based, multi-tenant computing environments, it’s more important than ever to be able to guarantee resources to infrastructure consumers. The advanced resource management capabilities of VMware ESXi continue to shine — delivering 39.2% better standard deviation among virtual machines. The erratic performance of Hyper-V workloads translates into an inconsistent experience and missed SLAs in densely-virtualized environments. Thanks in part to the full range of advanced memory management technologies in vSphere, VMware ESXi performance actually increased by 11.2% when more VMs were added to a host. Hyper-V, with apparently sub-optimal scheduling capabilities — and lack of memory page sharing, compression, and hypervisor swap — did not fare as well; performance dropped by 3.3% in a very reasonable oversubscription scenario. 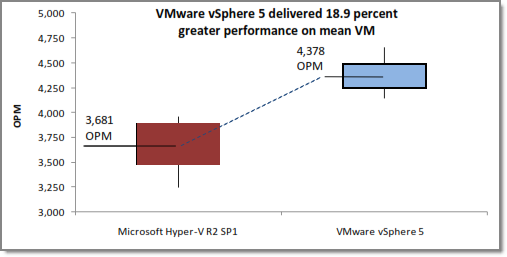 While Microsoft claims that Dynamic Memory, introduced recently in Service Pack 1, has closed the gap between Hyper-V and vSphere, these independent test results tell a very different story. Although that new feature does allow Hyper-V to power on more VMs than before, infrastructure architects will need to consider the performance impact on workloads in higher-density private clouds built from the unproven and less mature Windows-based hypervisor. Please download the full report (or summary) and see why VMware vSphere is the best cloud infrastructure platform. yes this is wonderful for vmware, at least in theory but since I can’t find the build docs I have no idea if its accurate. Did you download the full report referenced in the last paragraph? sorry missed the full report and it confirms my theory, lets do the same test and monitor the actual power consumption. I’d almost bet that the hyper-v one would be running with a lot less power consumption, I’ll admit the default configuration of w2k8r2 sets the power to balanced and this does impact the server performance more then 20%. also has vmware decided to remove the restrictions on publishing bench marks. Benchmarks can be published as long as the methodology is reviewed by VMware. bottom line if vmware doesn’t like the result it won’t get published. Did you see the report where VMware came in a distant second to Hyper-V in the ability to simultaneously run some VMs, check your Facebook, tweet, IM, play Angry Birds and listen to some mp3s? Who cares about scalability and performance when ESXi can’t do all that!?!?!? sorry no missed that one.. When Hyper-V v.next is released, will there a seamless upgrade path to that version allowing you to keep all workloads online? In other words, will you be able to add a Server 201X to the 2008R2 cluster and live migrate the VMs allowing you to upgrade one host at a time? You know kind of like how Enterprise hypervisors do. yes we handled the upgrade without impact to the customer, were you not able to do this. I’ll leave it to you to figure it out. Wow, you performed Live Migration from Hyper-V RTM, which did not have this feature to R2? Doing something during a maintenance Window so it doesn’t ‘impact’ the customer is not the same. like the way you say large enterprise will this one is only a 4 billion dollar a year enity, not real big but guess what they are very happy with the hyper-v deployment. The last version change was from the previous version, 2008 R2, to the current version, 2008 R2 SP1. Both of these products support live migration so no downtime during the upgrade. Seeing how you appear to be this threads obligatory VMWare apologist, it comes as no suprise that you prefer to continue to spout claims about what Hyper-v lacked in the original V1 release 3 years ago when most of the world is using the 3rd iteration of the product in production. Don’t really consider a service pack a version change. Next version of Hyper-v is widely considered v3, therefore RTM=v1, R2=v2. Nice dig, very original, no, not a VMware apologist, I just don’t give Microsoft the benefit of the doubt anymore, and nor should anyone with their past practices. They love to talk about vTax, and I agree, I wish VMware was a little less expensive, or at least tie the new licenses to memory only, and not a memory limit on the CPU license. Personally I welcome a world that no longer relies on Windows for everything, where MS competes on its product’s merits, not on the fact it is bundled with the OS that everyone is locked into. Why perpetuate that? Compare the storage sections of the test disclosures; KVM has an extra shelf of disks. 20%…..to bad that is not what it ONLY cost me to move from vSphere 4.x to vTax 5.0. Our first Hyper V cluster went up this last week, moved 6 DEV servers onto it. Next week will be the rest of our DEV servers. Few weeks later Production will roll. My vCenter will look like a ghost town in a few months. VMware is done where I work. V5 should have been a price decrease with HyperV R2 closing the gap so much….but the mental gaints at VMware raised the price with vTax…..STUPID MOVE. vSphere, 20% better performance, 60% price premium. Wow, what great value VMWare offers! Eric, I am at VMworld this week and there was no mention of cost. Why do you continue to focus on the bells and whistles versus the value you get for your dollars. Sheesh. I realize it is your job to be the spin doctor but I would love to see something practical in your posts rather than just trolling the Internet to fit your agenda. Glad you invested a week at VMworld, hope you got a lot out of the experience. I’m not sure that better performance, reliable resource management, and higher scalability can be considered bells and whistles. They do, however, provide great value to VMware customers. have you had a chance to work with windows server 8? Yes its pre production but it rocks! open hypervisor solution, what does thes meen to vmware? Is this true with specvirt 2010 and kvm? For example, of the 17 SPECvirt 2010 benchmark results published at spec.org, 10 were achieved using KVM technology, including the highest performance benchmark overall and the highest number of performant virtual machines running on a single host. It is quite ironic from VMware run such blog when we know that we are not allowed to benchmark VMware products! Gregory, that is not true. Benchmarking is allowed — to publish results the methodology just requires VMware review. have you ever seen a benchmark that show vmware in a bad light, the answer is no even if it was true, they wouldn’t allow the publishing of the benchmark. Obviously thats not true for hyper-v or other hypervisors..
All, I can say is live migration is a pure immitation of vMotion n several other features..
Who cares how much VM products cost, I will NEVER buy microshaft products, they are simply crap products with a price tag. I’m a consultant on VMWare and Hyper-v, lately I have had a 80% occupation on Hyper-V R2 SP1 and I am going to start a PoC with Hyper-V 3.0 Beta for a costumer searching for free replication and more than 8 vprocs. I only want to say you that with windows 7 or Windows 2008 inside the VMs I feel under the same conditions Hyper-V is better than ESX, for linux VMs and old OSs I prefeer ESX, but customers are starting to see there is no real problem using Hyper-V and I am thinking this is going to be the rule for Hyper-V 3.0. I can mostly say up tell this point hyper-v was a me too product but at this point things change somewhat. It will be an interesting to see how this all pans out in the next year or so.